With a bright and welcoming feel, our White Ginger room is certain to make for a lovely, relaxing stay! 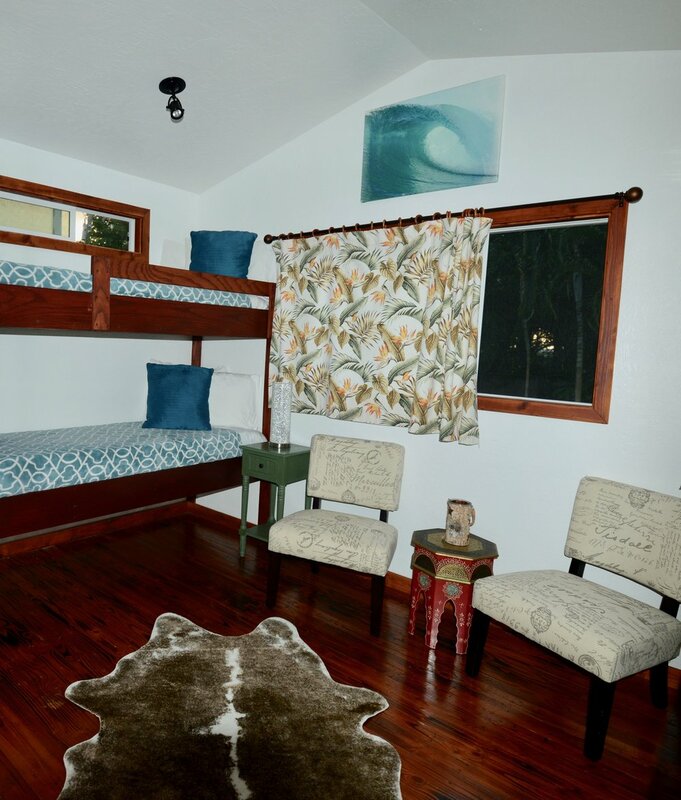 Featuring a king size bed (or can be separated out into two twin beds), as well as one bunk bed (2 beds) in addition, this room allows for great privacy and enjoyment as the front door leads out to a beautiful covered outdoor area. The room has a main bed, which can be set up as two twin-size beds or one king-size bed depending on what you request in advance. There is also a set of bunk beds (two twin-size beds). The White Ginger Room is perfect for a family of four who has two small children, or a couple who would love some extra space. Plus, when you're on your way out to, or coming back from, the stunning beaches of the North Shore, we do provide plenty of fresh bath and beach towels.With this room we offer air conditioning, cable TV, free Wi-Fi, bath towels, beach towels, a private security safe (large enough to hold a laptop), and on request we can offer a hair dryer, iron, and other amenities. If you would like the room to have the main king size bed made up upon your arrival (as opposed to the separate twin beds), please request this in advance. Our White Ginger room is perfect for a family of four with two small children.